Jan 8th I posted a blog about InCoWriMo - International Correspondence Writing Month. Tomorrow is day one of InCoWriMo and it isn't too late to sign up if you're willing to write (not email, or text, or fax) one letter every day for a month. But, I'm not recruiting for InCoWriMo with this post. I'm going to tell you about the first letter I'm writing for InCoWriMo 2015. I've decided to send it to the Dalai Lama, whose address is on the list of 29 people who would love to receive your correspondence. 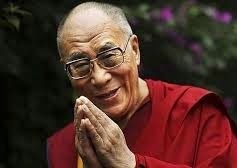 I've never written to the Dalai Lama before, and I wouldn't do it now just to add him to the list of people I send letters to in February. So what changed my mind? That's simple. A fifteen year old photo hanging in our living room did it. It's a picture of nine men posing in front of the model for the Crazy Horse Monument still under construction in South Dakota. The man on the back row, second from the right, is a friend of both the Dalai Lama and me. I call him the The Geshe of the A Team (read the blog and that will make sense - you'll also see the photo) here's the link Tibetan Monks - Sand Mandalas. Since a hand-written letter is a personal communication, I'm not going to tell you what I'm about to write to His Holiness. But if you read the blog I just mentioned you'll have a good idea. It's not often you have the opportunity to tell someone about a mutual friend who had a profound impact on your life. I'm off to do that right now.